There's nothing in this world that Ariel loves more than checking out for the latest fashion trends and creating amazing outfits inspired by what she sees online. 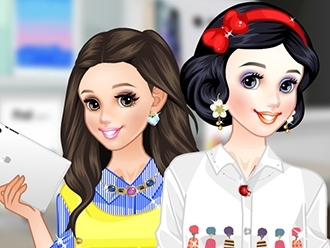 Knowing this, we have prepared for you an exciting new dress up game in which you will have the assignment of helping princess Ariel in her search for new fashion trends. She is a huge fan on Pinterest, and likes spending a lot of time pinning outfits she likes and inspire her. The game we created for you, called Ariel Pinterest Addict is the perfect mix of Ariel's favorite outfits, and this is why we wanted to share with you this dress up game. Have fun! Snow White is a true apple addict! And this concerns not only apple pies, apple smoothies and apple prints on her clothes - she is an absolute fan of Apple brand, too! She's got an iphone, ipad, ipod and a macbook and she dreams of buying an apple watch. Dress up this apple fashionista in edgy clothes that would reflect her taste.